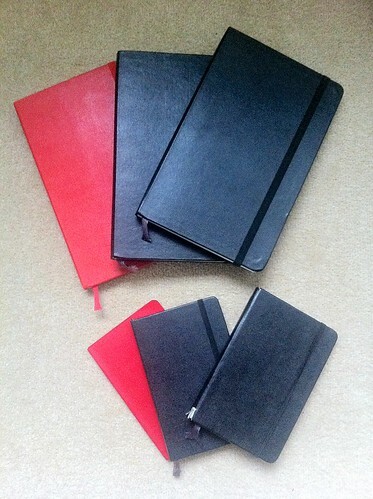 I remember how my relationship with Moleskine first started many years ago. I was browsing in Waterstones (Book Store) and I happen to come across a stand that was selling really smart looking notebooks. There were many different styles: Sketchbooks, Lined, Grid, Storyboard and so on. My purchase was the plain sketchbook (which I still have and use) and so began my Love/Hate relationship with the Moleskine range. A good place to start with my round up is with the positive experiences I've had so far. I love the look and feel of the Moleskine. The Black covers look really clean and professional. I’m using a hardback sketchbook which makes it great for sketching or taking notes while I travel on the train to and back from work. The quality of the paper is really good and the pages feel thick and sturdy. A piece of material has been incorporated into the design which allows you to mark what page your currently at which is a nice touch. Another feature that is incorporated into the overall design is a elastic strip that helps keep the sketch book closed while in a carry bag. Lets have a look at the other side of the coin now. My main writing tool is a fountain pen and so far I haven't found one that gives me a good writing experience. By writing experience I mean that while writing I tend to find the lines bleed ever so slightly and I get a lot of what I have done showing up on the reverse side. So far what fountain pens I have tried are the Cross, Lamy and Waterman range. I would love to hear from you if you have found a fountain pen that writes well with a Moleskine. During the last few years either as a gift or a purchase I’ve made, I have accumulated a wide range of Moleskines; Lined, Grid, Plain and Storyboard. The least enjoyable to write in is the lined notebook. The page thickness is so thin that anything I write ends up showing very clearly through the other side. The paper isn't dense which gives it a sort of see through effect. I have tried Gel, Rollerball and fountain pens but they all show through very visibly. Overall once I fill the last of my Moleskines completely I think we will go our separate ways for now. What's next for my notebook journey? I'm not too sure, I would love your recommendations.